If you can remember the time when neon colors and headbands seemed like a good idea, then the Crazy 80s slots are sure to give you a kick. Click here to play! Featuring the best of the worst of a decade where style went horribly wrong, the Crazy 80s slots may see you pulling out some old photo albums to reflect on youthful follies and fashion disasters. Charm bracelets and glitter lip gloss feature in this slot along with audio cassettes, big sunglasses and Rubik's Cube keychains. Records, boomboxes and awful accessorizing decisions don't escape the notice of the Crazy 80s slots, either, featured as high paying symbols to really drive those memories home. 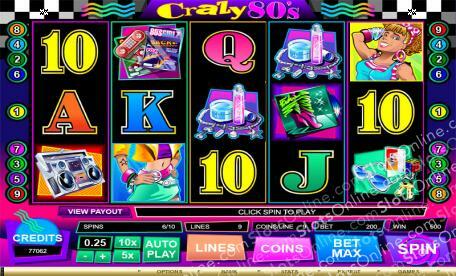 If you would like a quick trip down memory lane that could end in a massive win to keep you in the best fashions of the current decade, give the Crazy 80s slots a try. If you don't win enough money to keep in the latest fashions, then what will you have to make fun of in another few decades' time? The Record symbol is the scatter, paying wins on the total bet when 3 or more are scattered across the reels. 3 symbols pay twice the total bet, 4 pay 10 times the bet, and 5 symbols pay at 50 times the total bet. The Boombox symbol is wild and substitutes for any symbol other than the scatter symbol.